In a Six Nations rugby game early this year, Waleswinger George North had two head clashes in the match against England but continued playing and was then knocked unconscious while playing for Northampton in a club game. North said of his injuries: “In my day-to­day life I take an absolute beating and then if I can’t wash some dishes then something’s not quite right.” The accidents highlighted the importance of player welfare in the sport. 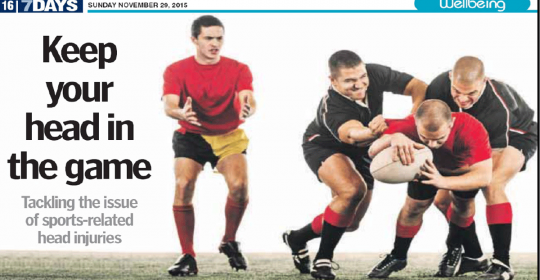 Experts say rugby-related head injuries are on the rise arid it can lead to associated traumatic brain injury (TBI). With the annual Rugby 7s on this weekend, it is important to be reminded of the risks and long4erm effects of high impact sports to health. According to statistics, TBI is the leading cause of death in the US of people under 45 and survivors are often left with life-long symptoms. A head trauma crisis in the American National Football League is also the topic of upcoming movie ‘Concussion’, starting Will Smith. Dr Erik Matser, clinical neuropsychologist at the German Neuroscience Centre in Dubai, says there are no official statistics of TBI in the UAE yet because not all cases are reported and there is a lack of awareness about its consequences. He adds TBI often occurs off the playing field too. “An old study at Al Ain Hospital found the most common cause of head injury was road traffic collision [67.1 per cent], followed by falls [ll.9 per cent] as the second most common. In just the first three months of 2015, 1,684 injuries and 147 deaths occurred clue to road accidents. Whiplash and concussion are the most common injuries, caused by traffic accidents and the number of unregistered concussions in UAE will be extremely high,” he says. Matser says although injuries are part of any sport, there are ways to avoid head traumas. “Prevent rough play; do not play on when you are concussed. 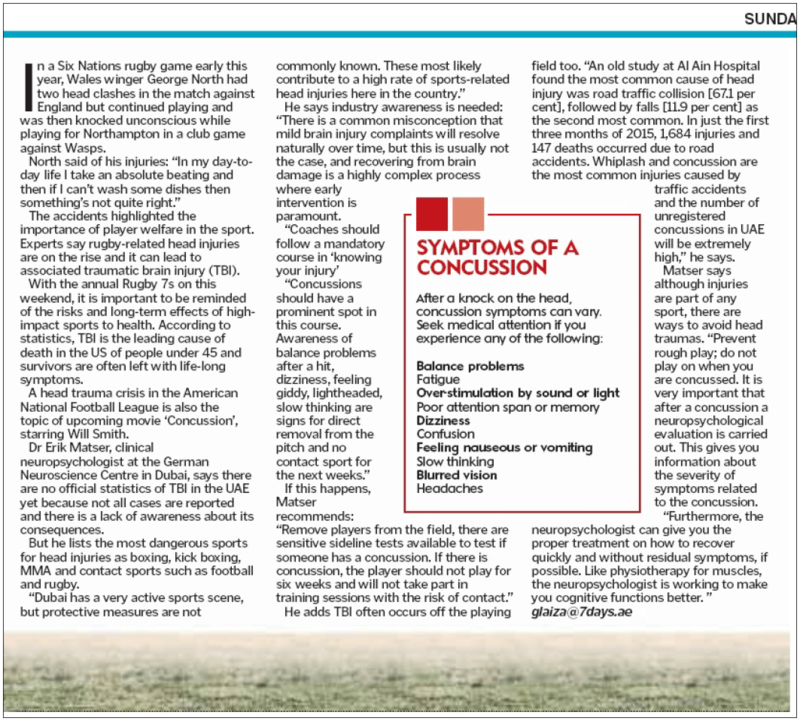 It is very important that after a concussion a neuropsychological evaluation is carried out this gives you information about the severity of symptoms related to the concussion. Furthermore, the neuropsychologist can give you the proper treatment on how to recover quickly and without residual symptoms, if possible. Like physiotherapy for muscles, the neuropsychologist is working to make you cognitive functions better.